After climbing in the southern Monte Rosa with the traverse of Lyskamm as the highlight, we still had a few more days before we needed to head back to Munich. 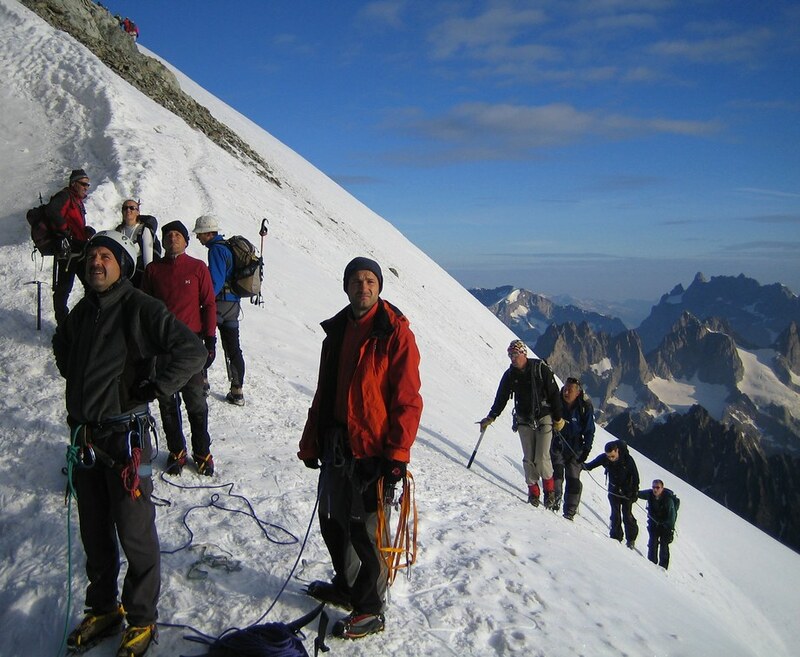 A few options where discussed, among them Rochefort ridge traverse with Dent du Geant in the Mont Blanc region. However, for this a rope team of three is not ideal. 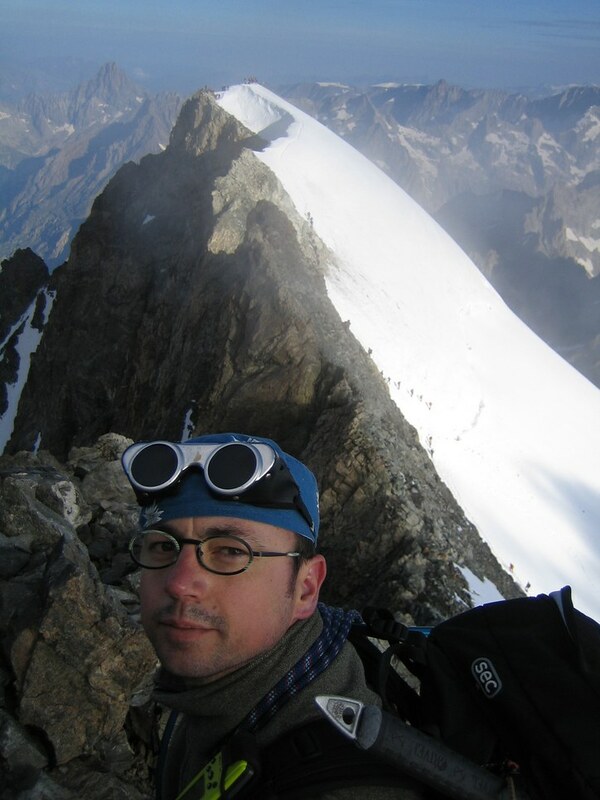 So Rainer suggested to climb Barre des Ecrins in the Dauphine region in southern France instead. 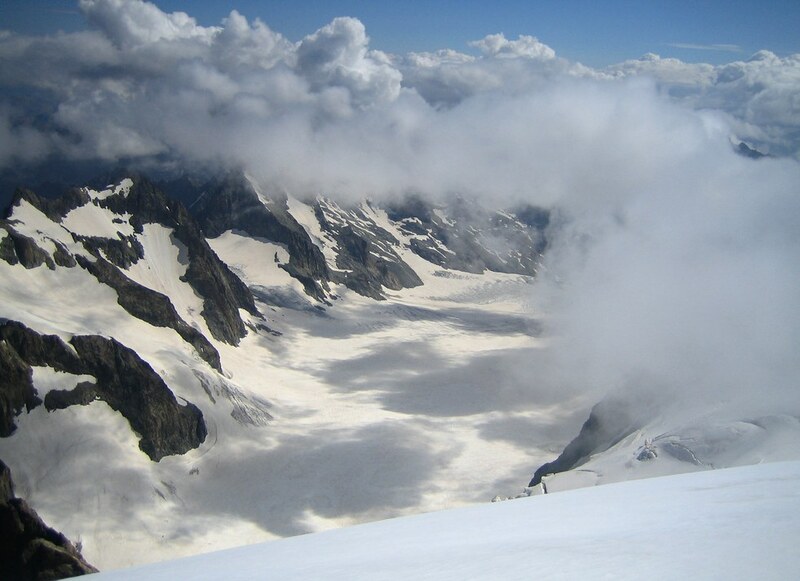 Barre des Ecrins (4101 m) is the southern most 4000m peak in the Alps. 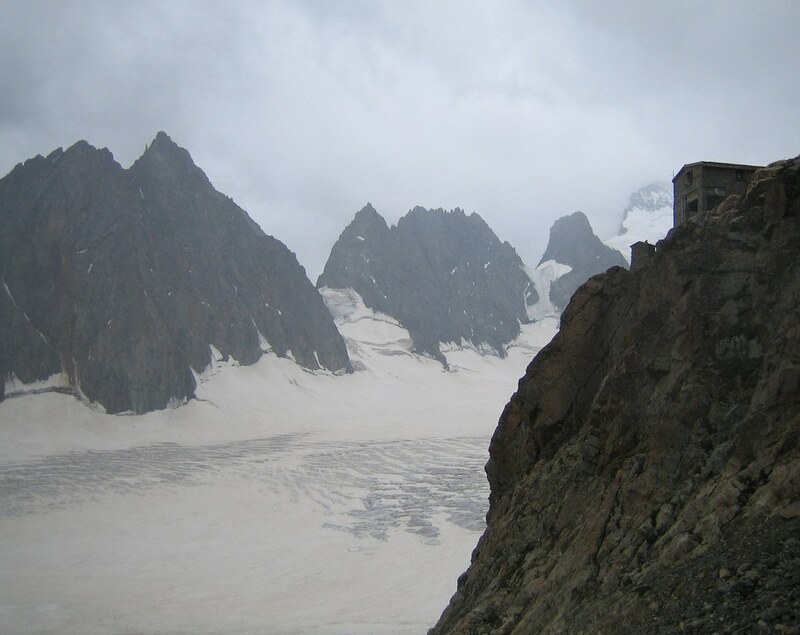 After some discussions we had a plan: We would climb to Refuge des Ecrins on the first day, summit and hike out on the second day, and drive back to Munich on the third day. We entered France via the Claviere pass, drove south through Briancon to the mountain village of Ailefroide where we spend the night at a nice small hotel. 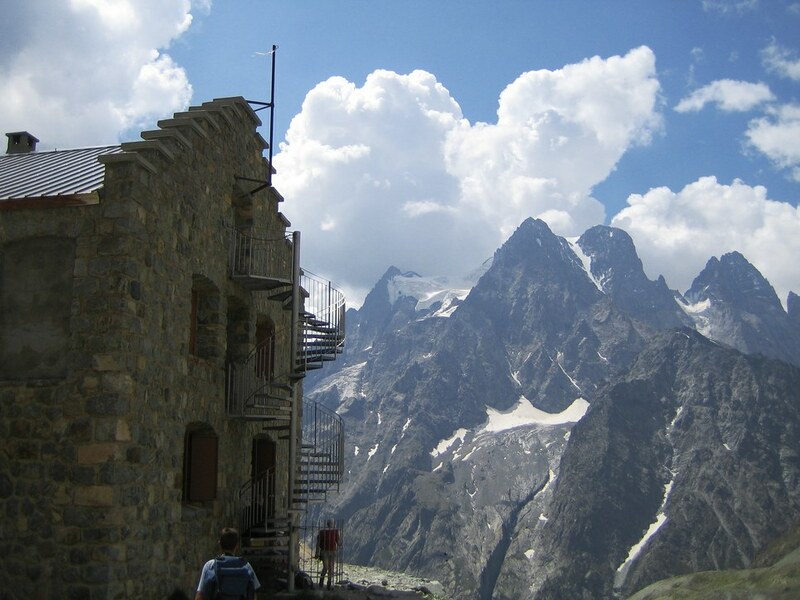 The next morning we drove up to the Refuge Cezanne (1874 m) where we parked the car and started the hike toward the Refuge des Ecrins. It was pretty busy as the hike is very popular with hikers and climbers alike. 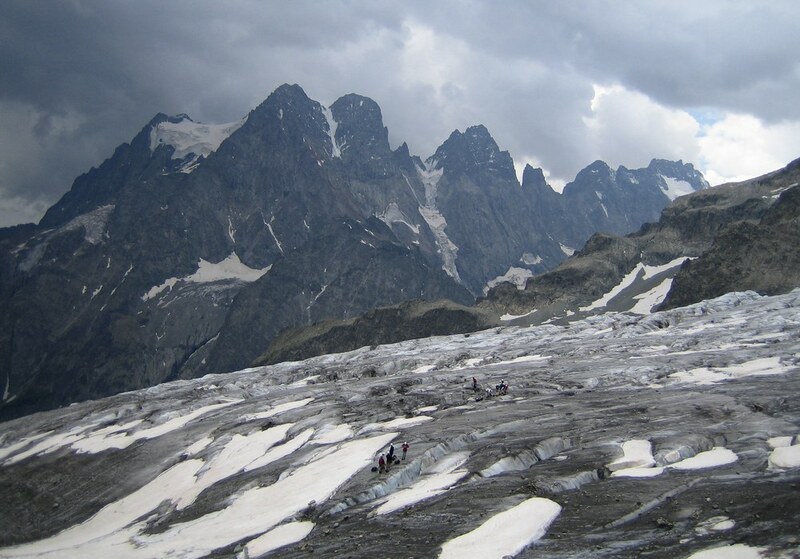 Half way up is the Refuge du Glacier Ecrins (2550 m) where we had a snack. 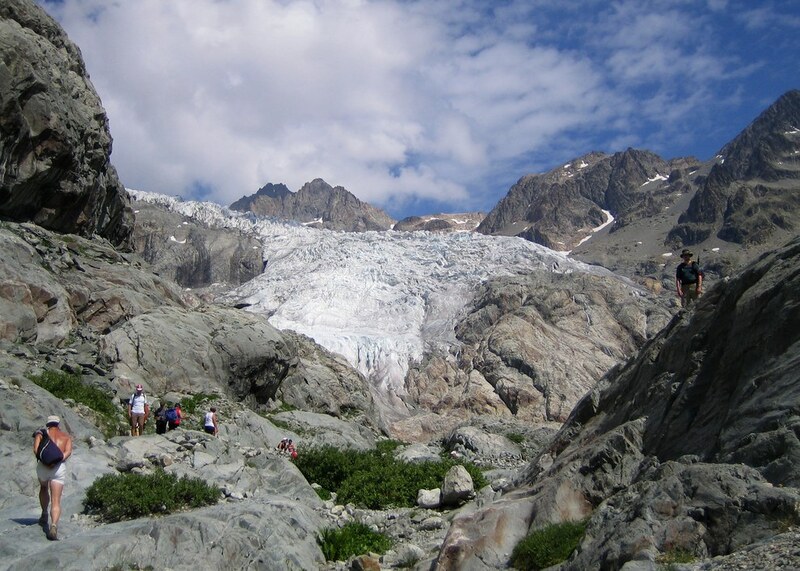 There are great views as one approaches the tongue of the Glacier Blanc. The whole area looks much different than the Monte Rosa region. 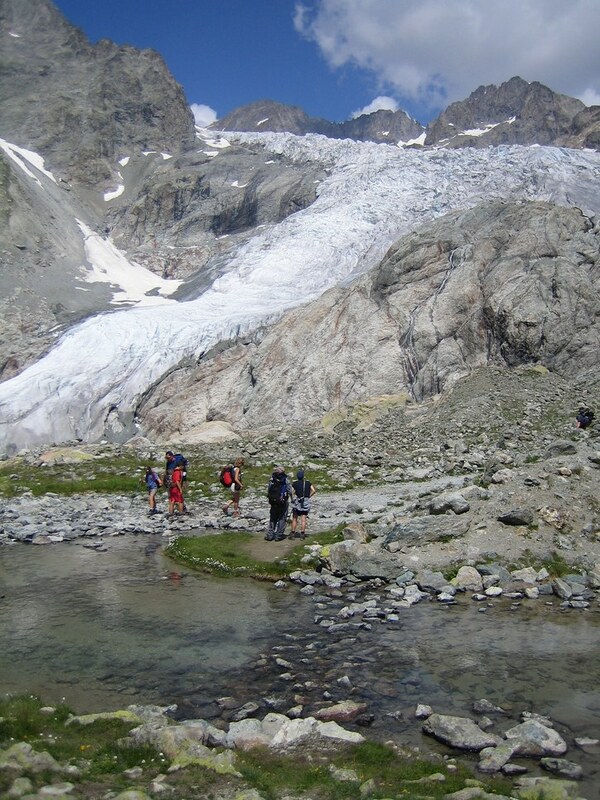 The trail goes mostly along the left moraine of the glacier. 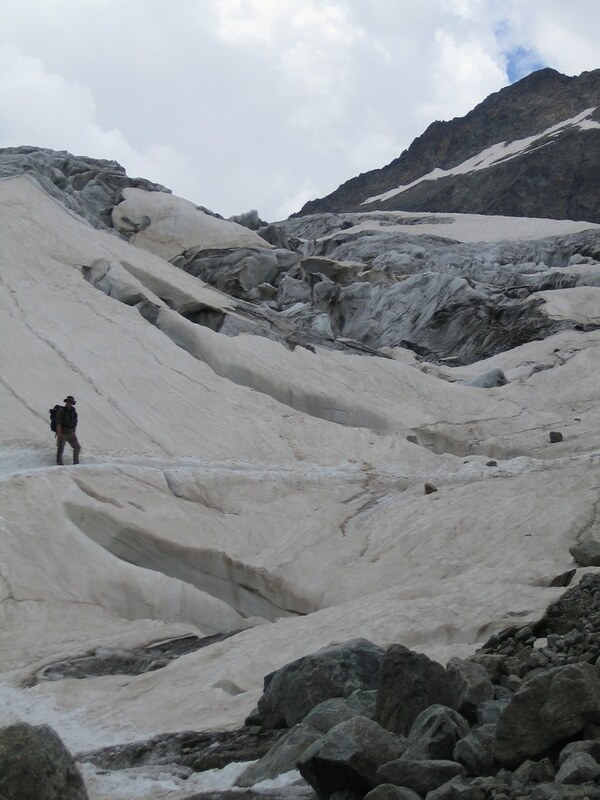 Only for the last part one enters the glacier and follows it on its left side. 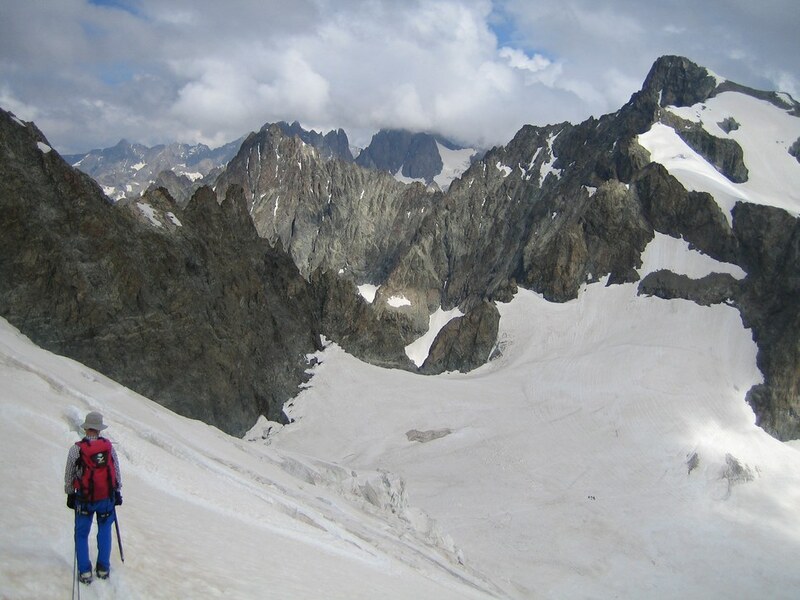 The Refuge des Ecrins (3170 m)is situated high above the glacier, so the last 30 min consist of ascending a steep and unpleasant boulder field. When we arrived at the hut there weren't many people. 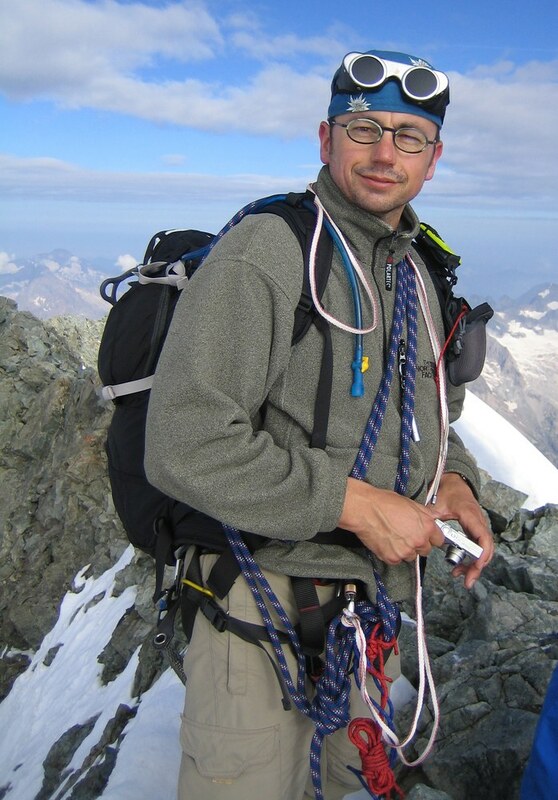 But as it got later more and more climbers arrived and when it was dinner time all 80 spots where occupied. The dinner was of exceptional quality, especially when contrasted with what we had the pleasure to enjoy at the Refuge Margherita on top of the Signalkuppe a few days before: After a starter (soup) we got roast hare with a delicious mushroom sauce and finally some fresh fruits for dessert. No wonder it was so delicious: They had a real chef up there! A French chef with a white chef hat! After people had finished their dinners, he went from table to table to ask how his creation had been received. Needless to say, he got a lot of praise. He seemed to enjoy that so much that he made another round to accept even more praise. It was quite a funny scene. 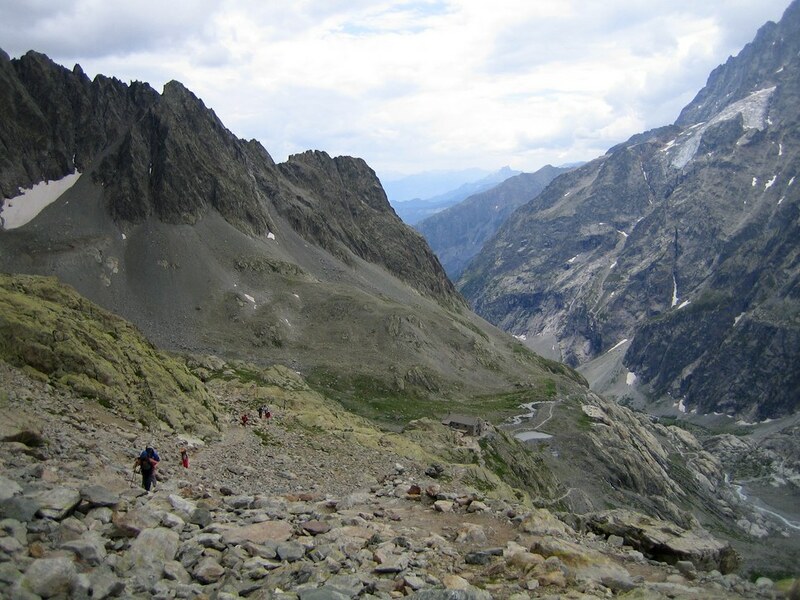 However, we were worried that all these people would try to ascend Barre des Ecrins the next morning. While for the most part the climb isn't more than a hike up the glacier, the last few hundred meters are along a rocky ridge (II). And the last thing we wanted is getting stuck behind all these people on that ridge. The wake up call came at 3:30am. The race was on. Everybody rose and scrambled for their stuff before heading down to fetch some breakfast. A few minutes later people grabbed their packs and armed themselves with head lamps and ice axes for the race down the boulder field and onto the glacier. It was ridiculous: People kicked rocks onto each other in the dark, people fell, people passed each other in a dangerous way. No, that's not what I had in mind. When the three of us finally reunited on the glacier at 4:30am -- we had been separated on the boulder field -- it turned out that everybody had made in down unharmed. We roped up and continued up the glacier. 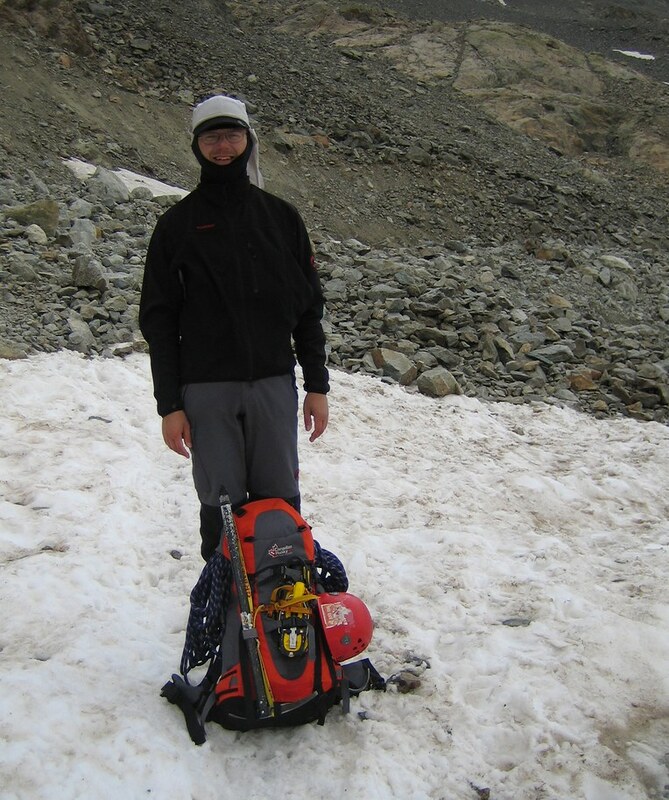 This was not the usual slow predawn glacier trudge but a quite exhausting race. 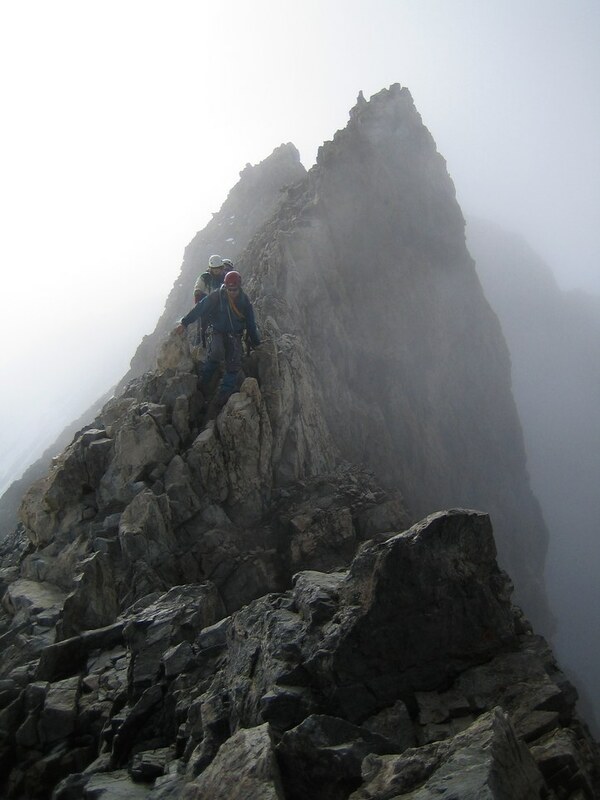 There was a well trampled spur and the climbing was easy until we had to cross the bergschrund to get to a saddle called Breche Lory (3974 m) between Barre des Ecrins and Dome de Neige des Ecrins. 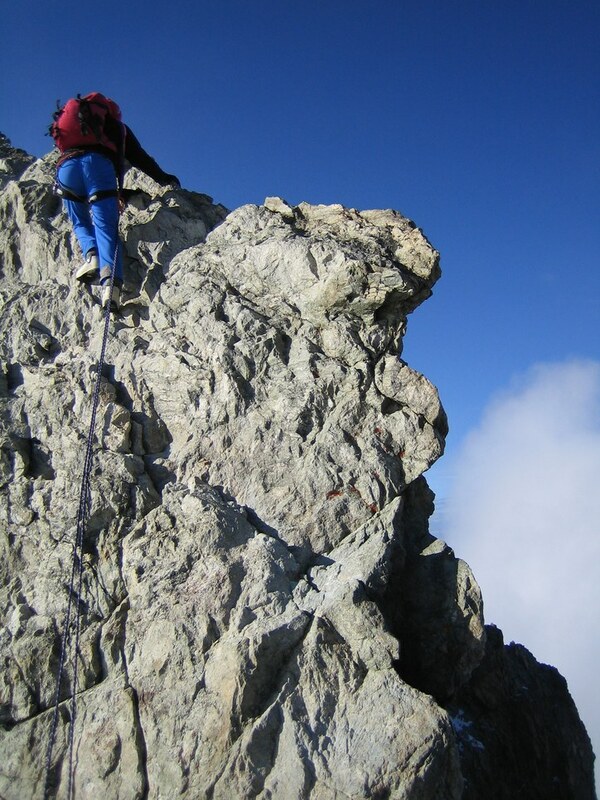 Here one gains the rocky ridge that leads to the summit of Barre des Ecrins. 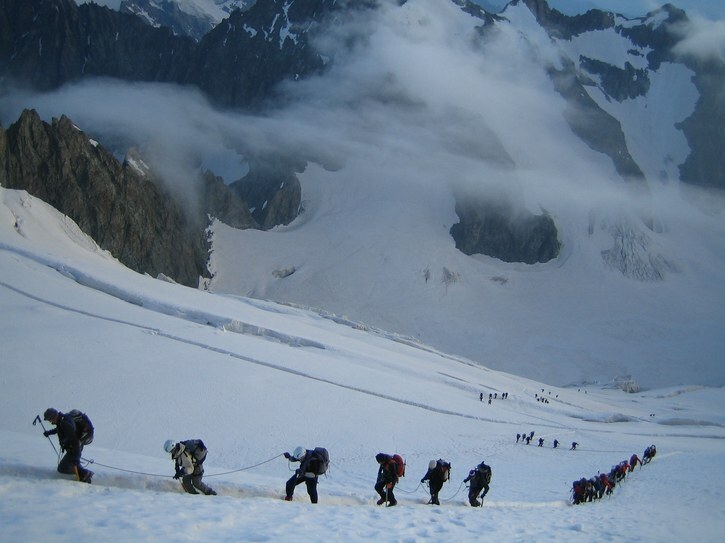 There where a few rope teams ahead of us but the situation was much better than what we had expected: It became apparent that the vast majority of climbers didn't actually intend to climb Barre des Ecrins but instead the Dome de Neige des Ecrins. 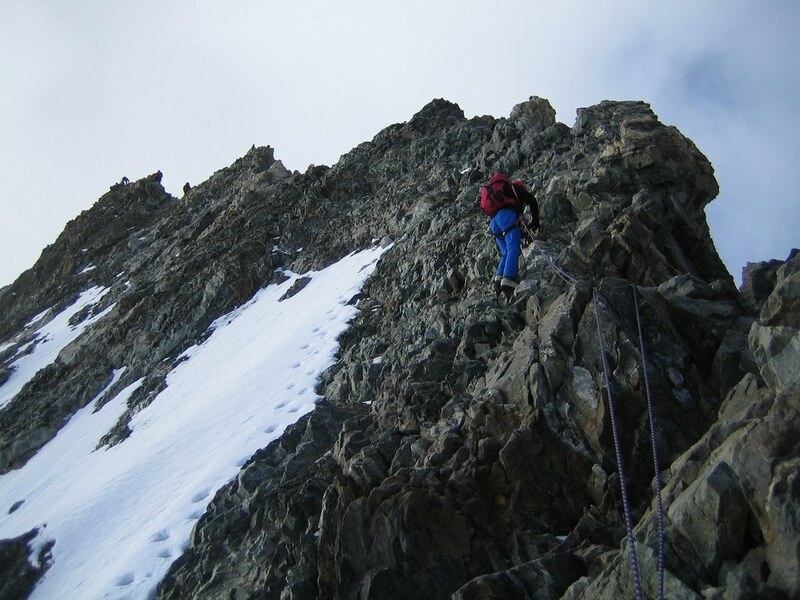 There where a few difficult moves in order to gain the ridge as it was pretty icy, but from there on the climbing was easy and pleasant. Rainer felt like unroping as the rope drag was pretty bad at times, but Claus-Dieter and I didn't feel ready for that yet. Clouds where moving in and enshrouding the ridge at times. It was a great atmosphere to climb in although we couldn't see very far. 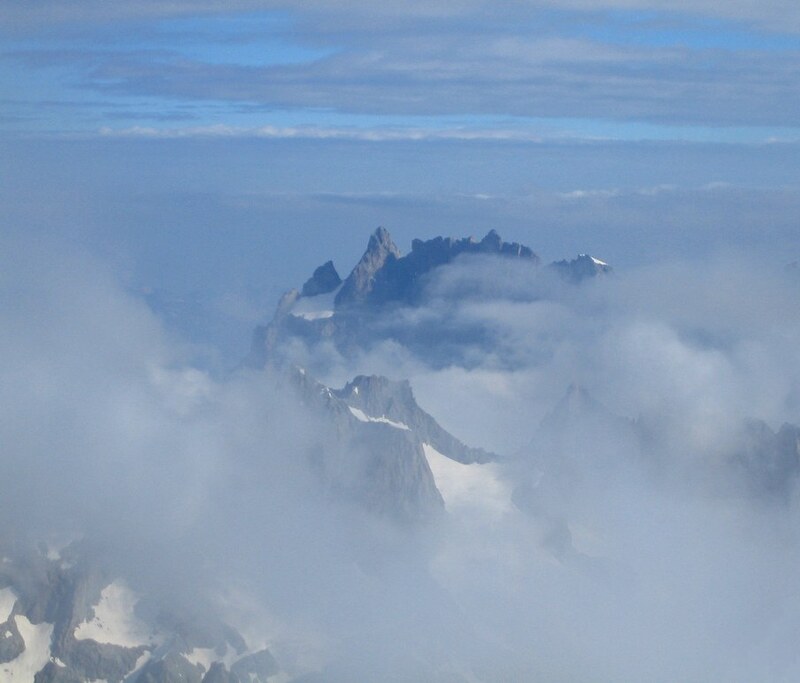 We arrived at the summit of Barre des Ecrins (4101 m) at 9am. There we had a pleasant conversation with another party who had climbed the more difficult East ridge (AD, II and III). 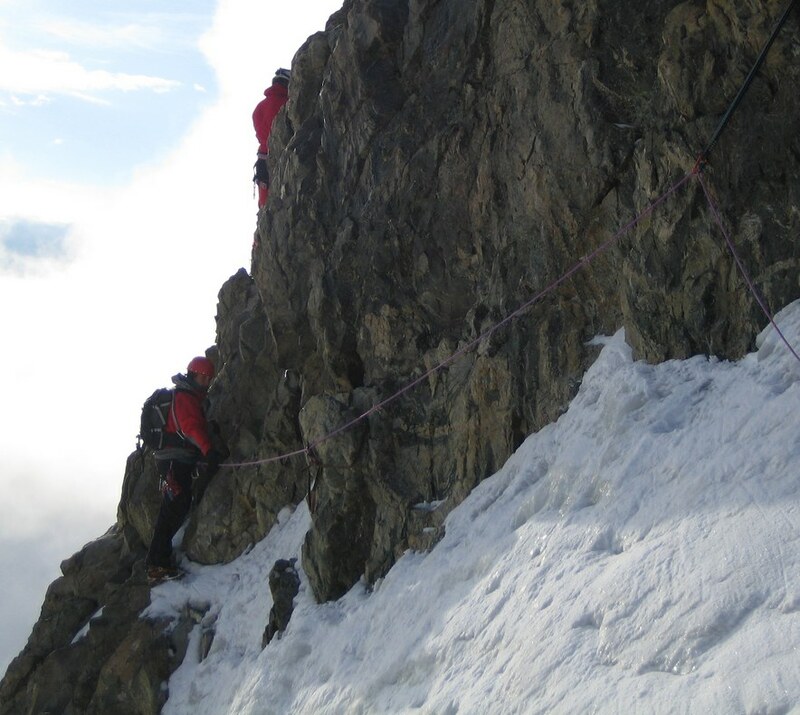 Finally, we headed back the same way but rappelled the last part down to Breche Lory. Overall, we had encountered no more than 10 people on the ridge. 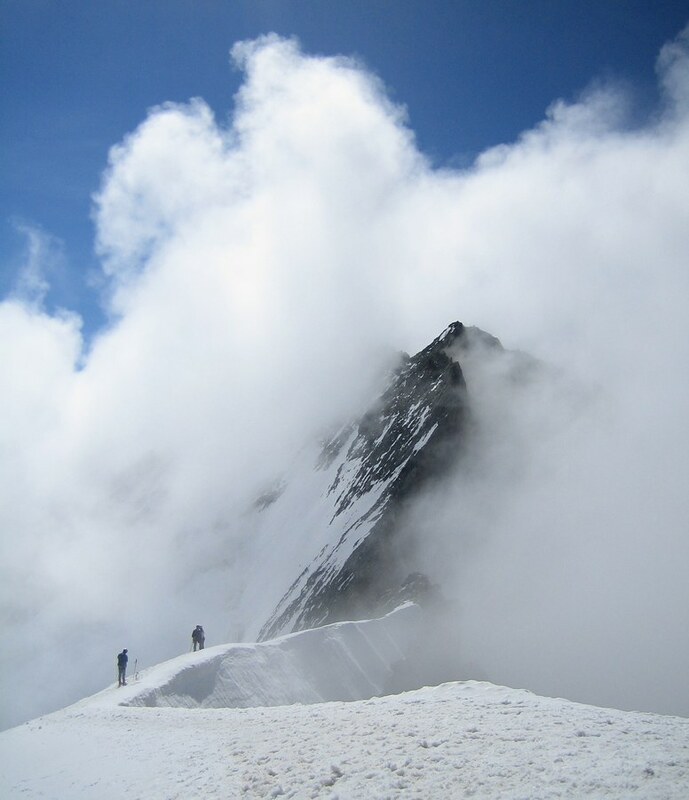 We didn't leave without paying Dome de Neige des Ecrins (4015 m) a short visit. Then we headed down the glacier. The way back to the car was a long trudge, uneventful except for a delicious dinner at the Refuge du Glacier Ecrins. We stayed another night in Ailefroide and drove back to Munich the next day after a few great days of climbing fun in the Western Alps.